Uganda offers more than the gorillas and the plenty wildlife animals on a self-drive safari let us introduce to you the ensenene: Nsenene is the Luganda name for Ruspolia differens commonly known as grasshoppers a bush cricket that is a central and south-western Ugandan delicacy as well as an important source of high nutrition value. 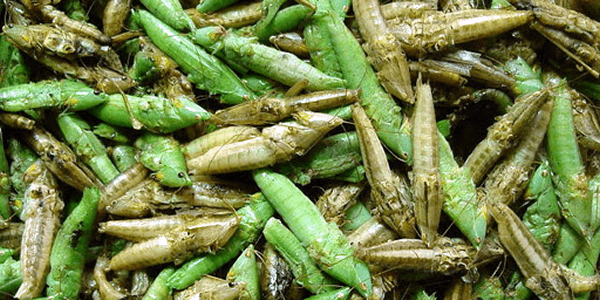 It is believed that Africans have been eating grass hoppers since Biblical times. Apart from being so tasty, these edible insects are actually a high value source of nutrition on the wings, researchers have found. They contain exceptionally high amounts of proteins, fat, dietary fiber, and ash. Also grass hoppers provide a cheap and often free source of food as they are freely available in the wild for anyone willing and able to trap them. This delicacy if you are to eat, nsenene are plucked and washed before cooking them.The insects are a cheap food since you do not even need cooking oil to fry nsenene. The insects can fry in their own fat. Apart from being fried and flavored with onions, nsenene could also be boiled or sun-dried and eaten on their own or served alongside other dishes. These most loved insects are seasonal and it is believed that even if the come in a season when your husband is not their at home the wife must keep for the husband even if he takes years to come back.they are well preserved in a glass bottle with a tight cover. Nsenene in Uganda is not only a delicacy but also a totem abe nsenene_ Cone-headed Katydids. The Nsenene clan has a very important ritual it performs in Buganda every grasshopper season. The eating of the first grasshoppers which are delicacies in Buganda and beyond used to be cleansed by an Nsenene clansman who was required to jump over his wife or consummate with her to initiate the eating of these seasonal delicacies. This ritual was meant to increase their prevalence and also to stop any family member to fall sick. The Nsenene royal duties included supplying the king with a wife, with construction poles. They also have the honor of presenting the wooden milk pot to the ascending king during the crowning ceremony and the king sips. You do not want to miss this opportunity to taste these delicacies in Uganda on your self-drive safari or guided safari in Uganda with a budget Rav4 that can easily take you to all these places where you can taste the Nsenene.